The band can provide something different for a festival whether it be a change to the usual ceilidh, an outdoor event or a wildly imaginative piece of programming. In 2015 the band closed the Hebden Bridge Arts Festival with a wild outdoor barndance that got the whole square jumping. 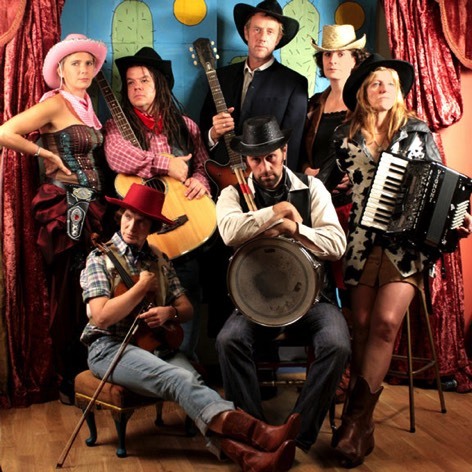 In 2014 and 2016 the band opened the Hebden Bridge Folk Roots Festival with packed cowboy ceilidhs in the Town Hall. For two years running - 2010 and 2011 - the band opened the wonderful Grassington Festival in the main square with an outdoor barndance which got locals and vistors alike dancing and the festival off to a great start. There's a short video on the "movie time" page. In 2011 the band performed at a series of outdoor events at the Lakes Alive Festival as part of the Cultural Olympiad. These evening "banquets" brought music and street theatre to a string of Lake District towns. In 2010 we opened the Fell Edge Festival with a riotous indoor barndance which brought festival goers together for the start of the weekend.